The first stop out of three in Levy’s culinary documentary is Chicago’s own Alinea, a restaurant toting three Michelin stars and the title of 15th-best restaurant in the world (down from 7th in 2012) according to the prestigious San Pellegrino 50 Best List. Alinea is at the cutting edge of molecular gastronomy, a hybrid of technology and technical chef skills that attempts to capitalize on all aspects of cuisine including aroma, aesthetics, and, of course, taste. Head chef Grant Achatz, wrapped in a scarf, with wild eyes and flourishing hands, walks the line between artist, chef, and scientist, serving up dishes that take haute cuisine to new heights. However, Achatz has other things on his plate besides running one of the world’s top restaurants. After being diagnosed with stage four oral cancer and thinking he would have to undergo disfiguring surgery, Achatz instead received an intense chemotherapy and drug treatment at the University of Chicago Hospital and was cancer-free after three months. Directly after finishing treatment, Achatz once again started working into the wee hours of every night, sleeping an average of four hours a night, knowing that his lifestyle makes the cancer, which already has a 60 percent chance of returning, more likely to recur. Despite such dire possibilities, Achatz simply can’t bring himself to stop working, especially as his and his partner Nick Kokonas’s new conceptual restaurant Next continues to garner worldwide acclaim. Flipping back and forth between three restaurants, Levy works his way even further into the American heartland with Breitbach’s Country Dining in Balltown, Iowa. The Breitbach family has run this tavern in a corner of Iowa near the Mississippi since 1862. Levy soaks up the small town vibe as customers and the Breitbach family itself try to explain the intangible nature of a restaurant that is “like home, or what you’d wish it to be.” Breitbach’s somehow became much more of a “community center” than a restaurant, and when the restaurant burned to the ground in 2007 and again in 2008, the community pitched in to rebuild Breitbach’s in time for its 150th anniversary. The third focus of Levy’s documentary is La Cocina de Gabby, a Mexican restaurant in Tucson run by Francisco and Gabby Martinez. The husband-wife duo serve up authentic Mexican food in an endeavor that is equal parts financial and emotional; Francisco’s faith in his wife’s cooking is tempered by their financial hardship and need to support their young daughter. The documentary lags a bit in the lengthy sentimental depictions of Francisco and Gabby’s restaurant, although the hardworking couple’s plight does strike strong emotional chords. Gabby and Francisco weave a tale that is worthy to note—though sadly, not for being unique. The arc of La Cocina de Gabby is one steeped in American-dream ideals, religion, and family, but at times seems hazy on its connection to food and cuisine itself. However, this departure, notable in parts of the Breitbach’s sequences as well, is part of what separates Levy’s Spinning Plates from typical culinary documentaries, and even from some of the more original movies in the genre. Levy attempts to understand restaurants as a whole more than the cuisine they produce, examining the ways that people commune and connect over food. Levy found his perfect subject in Achatz, who grew up working odd jobs in his parent’s diner in a small Michigan town, and went on to become a world-renowned experimental chef. 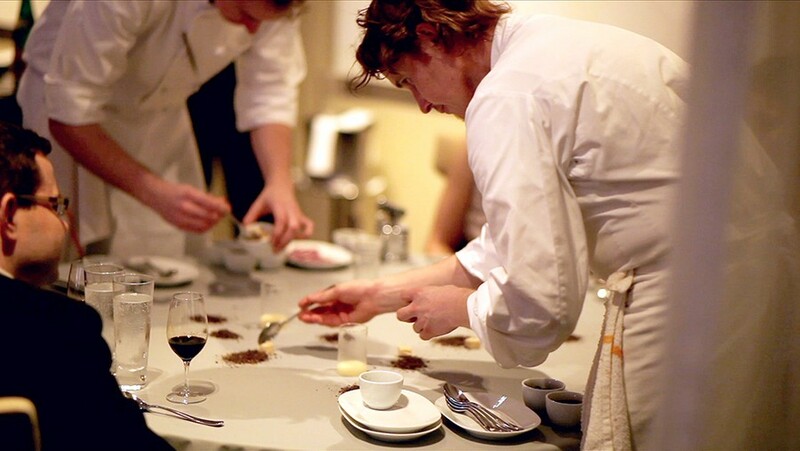 Despite his current status, Achatz highlights the similarities between places like Alinea and a small-town diner, asserting that they both work toward the same goals. Achatz asserts that in homey restaurants, people open up because they are so comfortable, and at unique, unconventional restaurants like Alinea, people share a moment because their experience is so radically uncommon. Achatz attempts to “make people feel comfortable and exposed” at the same time. As Levy constructs his point, he certainly succeeds in proving that “it’s not what you cook,” but perhaps fails to answer the “why.” Hints are provided: The subjects of the film cook for reasons financial and emotional, in the search for artistic expression, or to create a place worth calling your second home. Perhaps these incentives are more similar than one would expect. Humans, after all, are social animals. According to Levy, we’re apparently also social eaters. Spinning Plates, directed by Joseph Levy, is playing at Landmark Theatres' Century Centre Cinema.